Home » Blog » What Causes Poor Airflow in My Ductwork? What Causes Poor Airflow in My Ductwork? Almost every home has an airflow problem in one room or section of the home. Most homeowners just live with poor airflow. Fortunately, we can fix airflow problems in the vast majority of homes with these issues. The most common reason for poor airflow is a duct system that is not graduated and not sized for proper CFM distribution. Another design flaw is an undersized cold air return system. Prior to the 2012 energy code for new construction, 99% of the homes averaged between 25-40% air leakage because the ducts were not properly sealed. Duct Modification – Either adding additional cold air returns to reduce static pressure and/or size supply ducts for proper CFM. Zoning – The only 100% money back guarantee for ensuring a uniform temperature throughout the house. Aeroseal – Recommended by the Department of Energy and most utility companies. 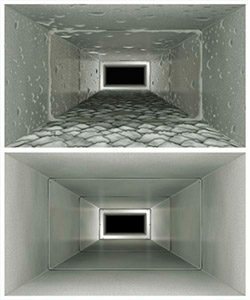 Seals from within 90-96% of all duct leakage. Call for a service request! Keep updated on all these Official Heating & Cooling and HVAC news by liking our Facebook page! Is your A/C making noise? Find out why and then make an appointment with us! Our services include air conditioner repairs in Gilberts, Elgin, Crystal Lake, and many other service areas!